Playing Farmville in the hostel's common room: who thought that could lead to anything more productive than harvested raspberries, and time – less than well – spent? But it did. Simply being in a common area around other people allowed for conversation to flow around me, whether I was partaking in it or simply collecting wool from my digital sheep, and milk from my digital cow. It also allowed for me to jump into conversation when a topic of interest came up, “oh – where were you in South East Asia?” and so the night progressed. As I joined the conversation with a guy who turned out to be from Ottawa, so too did a girl from Australia, last few years spent living in London, turn from her Scrabble game to join in a well. Then another Ozzie, and another Londoner. The most interesting tales were from a twenty three year old from South Africa, recounting tales of how in elementary school he was taught the ways of the noble white farmers protecting their farms from the blacks – and how with crayons he had to colour pictures with the well to do people coloured peach, and the slaves coloured in black crayon. Not the best of times, he recounted. It also seemed distressing that in South Africa there are some serious downloading limits on internet usage. Apparently it costs 10 dollars a gig, and most people only download two or three television episodes a month, and then join each other at giant LAN parties to swap files – like the late nineties, early two thousands, in Canada. When a girl from China turned to us, our group was completed, and it was suggested we leave the hostel to explore the famous Reykjavik night life. I had read that Reykjavik was known as one of Europe's “coolest capitals,” with a “crazy night life,” though the tame shoppers I saw during the day did not work to convince me of this – nor did the small crowds in the bars around 11:00pm. 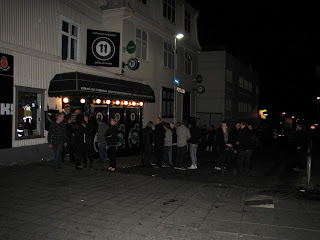 But – let me tell you – on a Friday night in Iceland, I do not think the bars close. And as such, by midnight the bars started to fill up. From one pub to the next, we transitioned trying to find a place with charm, people, but that wasn't overly crowded. And cheap beer would have been nice too – though I doubt that exists here. 750 kronur was the cheapest we found out of seven fine establishments. We started in a tame little place, which was abandonded for being too empty. We then ended up in a bar with a tiny dance floor for which the late forties, early fifities had just hit. The music was old, and the dancing was awkwardly reminicient of a movie where the people are told to move, and the soundtrack would be added later. A number of other clubs were entered, then abandoned in this fashion until we settled at the Celtic Cross, one street over from the main drag. It had a fine selection on tap (not limited to Viking, as some places were) and there was a live band in the basement. This was all I needed, and the addition of talkative local girls seemed to add the necessary flair for some of the others I was with. It was one in the morning, and finally the night was getting started for most people. The tame bar we started at now had a line up around the building. The music switched between angry early 90s American rock, to – assumed angry – Icelandic Punk. This was music I could get behind, and dance to, and feel good about. When three thirty came three of us headed home, leaving the Ozzie, and the South African to try their luck with the locals (they would not return until well after five.) As for the Brit? We had lost him three bars back, and he wasn't seen again. Walking home in Reykjavik is no simple task after a night out. It is an obstacle course with pitfalls, and disasters waiting at every misstep. Five hundred points for avoiding the boyfriend and girlfriend who, only a second ago were standing up and making out, now lie on the sidewalk at your feet. Three hundred points for every broken bottle, pint glass, and other piece of sharpened wreckage you avoid stepping in (this is where the real points are made, because the ground on a Friday night, looks like a “Mexican Barbed Wire” fence: nothing but glass shards sticking out of concrete. And finally, two thousand bonus points for avoiding the girl, pants down around her ankles, squatting behind a car, expelling her liquid waste that had built up over the night. That's not even to mention how dressed up everyone was – some to look good, and others in costume. Reykjavik, you have indeed proved yourself to me as one of Europe's Coolest Capitals. Good on you. Glad to be the China girl exploring the crazy night life in Reykjavik with you... take care, my dear friend!